This 5 star resort offers every amenity, including a world class spa, mercado, infinity pools, an infirmary, exceptional artwork, and a quaint chapel. The Executive Suite has one bedroom with two queen beds, sitting area, a large balcony/terrace overlooking the ocean, two spacious and well appointed baths, a sizeable kitchen, dining area, and living room with comfortable sleeper sofa. GATED, GUARDED, PRIVATE, AND SECURE. Walk everywhere; pools, beach, and restaurants. Inclusive access to other PB Resorts and Jack Nicklaus Golf Course. RENTAL NOTE: Book any week in 2017, per availability. $200/night for 7 nights ($1,400/week). Non-Refundable Deposit $700 due upon booking; Balance Due 2 weeks prior to stay. ** BONUS ** Can book 2 suites and sleep up to 12, per availability. The living area of your Executive Suite is nearly 1,100 square feet of luxury, complete with an additional 200+ square foot ocean view balcony/terrace - adding up to over 1,300 square feet of space for you to enjoy. Daily maid service is included. Also at your disposal is use of the use of award winning health spa which includes complimentary use of hot and cold pools, steam room, fitness center with cardio and weight machines, free weights, and a workout studio which offers spinning, yoga, and aerobics. In addition, luxurious spa treatments are available for a nominal fee to make your stay a truly relaxing experience. There is also an on-site chapel and medical facility should those additional services be of interest to you. Use of Jack Nicklaus Golf Course and Club House. Complimentary Shuttles to all Cabo S.L. Pueblo Bonito Resorts. Between this resort and its nearby sister properties, you'll be able to enjoy ample beach related and hotel activities such as volleyball, swimming, snorkeling, jet skiing and para sailing, just to name a few (note: in-ocean activities not available at Sunset Beach due to undertows, however it's really not a problem with all the pools on site AND the resort provides all-day, complimentary shuttle service to their partner resorts Pueblo Bonito Rose and Blanco at Medano Beach on the Sea of Cortez. (Eastern side) - directly across the waterway from El Arco and Lover's Beach.) Other non-water activities at the resort include Mexican Pottery Painting, Cooking Classes, Wine Tasting Classes and much more. Be sure to enjoy all the area has to offer including Zip Lining, Horse Back Riding on the Beach, ATVs, Snorkeling, World Class Sport Fishing and much, much more. My family has owned these executive suites for ten years and we have had many wonderful vacations with our children here!! There is truly something for everyone. The resort offers a kids club for the little ones, and they love it. My older kids love to take the shuttle bus down to Medano Beach for water sports, bars and restaurants. Sunset Beach is only five minutes to town so it's quick and easy to get into town without having to stay right in the middle of busy downtown Cabo/Medano Beach; downtown Cabo/Medano has a really active nightlife, which is fun for all of us to visit. We love the Marina's Mercado, Dolphin swims, and wide variety of water sports. The Sunset Beach hotel offers all the amenities of a 5 star resort; pools, tennis, beach volleyball, ping pong, kids club, great restaurants, pool side dining and world class golf! It has an amazing spa and fitness center and the location cannot be beat! 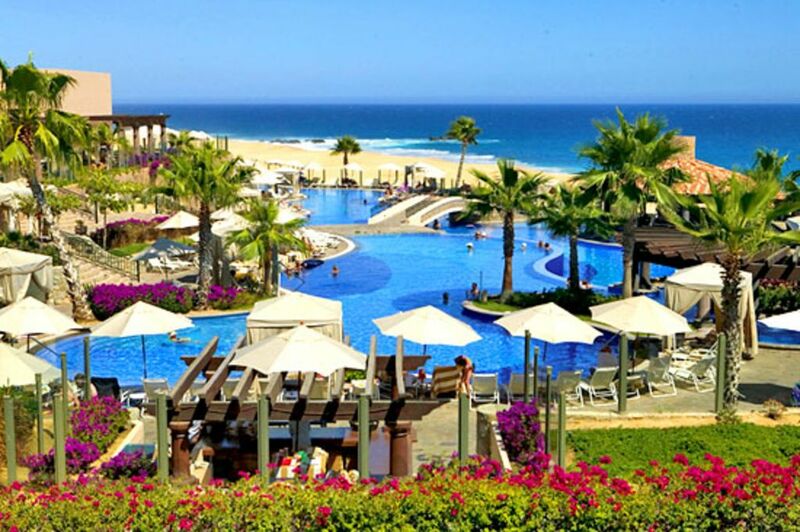 It's only 5 minutes from downtown Cabo but feels a world away behind it's guarded, gated, upscale, private grounds. One of the best features of this resort is that it is really 4 resorts in one - you have complete use of the Rose and Blanco on Medano Beach (with free shuttle) - great for teenage kids and adults, and you also have access to the Adult's only resort - the Pacifica, which sits adjacent to Sunset Beach. Each property has something unique to offer - what they all have in common is luxury and fine works of art! The resort is extremely well kept and the service is impeccable. The locals work hard to attend to your every need. There's, plenty to see and do without ever leaving the resort. If you have never been to Cabo San Lucas you are in for a treat. The weather is amazing -dry, sunny and warm throughout the year. You can whale watch off your balcony and experience the best deep sea fishing anywhere. You have the quiet tranquility at the resort and the great nightlife of Cabo, including nearby adventures, fishing, and eco-tours. Cabo San Lucas is also famous for their golf courses and the new onsite Jack N. Signature Course at Sunset Beach is best in class. Every suite at Sunset Beach offers premium ocean views and guests have full access and shuttles to all four Pueblo Bonito resorts in Cabo, including two resorts in the heart of Medano Beach. You also have use of Pacifica, which is an adult only hotel next door and is magnificent. There is a complimentary shuttle van to take you down the hill to this special resort. Sunset Beach has four separate pool areas, with multi-level freeform pools and swim-up bars, poolside dining, Jacuzzis and beach side hydotherapy pool. The resort offers 24 hour dining, tennis, spa services, fitness center, sand volleyball, ping pong, and a full kids club. A full time concierge desk for assistance with everything from restaurant reservations to golf, fishing, watersports, or land adventures. There is even an onsite mini market, internet cafe, deli, dr. office and church. Luxurious bathrooms with stone flooring and counters throughout. Daily maid service. Dishes, utensils, cookware included. Coffee pot, toaster, blender included. Jack Nicklaus Signature Course - just opened! !